Συντάκτης: dikaiopolis , ημέρα Κυριακή, 28 Μαΐου 2017 και ώρα 9:04 μ.μ. Maligned for centuries, the Empire that checked the Ottoman advance into Europe is today being celebrated. One of the world’s great Empires is on the move, in our imaginations and in the place that it occupies in our understanding of the modern world. Byzantium used to call to mind a sterile, bureaucratic and yet violent society, corrupted by fatuous complexities. The worst failings in our own societies would be described as Byzantine. But over the past 20 years this image has begun to shift in important ways. Two great exhibitions at the Metropolitan Museum of Art (in 1997 and 2004)—and more recent ones in Paris, London and Bonn—brought a large audience face to face with a thousand years of riveting artistic achievement. And a new generation of scholars has emerged, re-evaluating the very idea of Roman decline or Dark Ages and arguing that the barbarian forces that occupied the empire’s western provinces adopted, adapted and thus perpetuated many of the Roman methods of administration. The term “Late Antiquity” embodies this long period of transition, which transformed the Roman world while integrating aspects of Latin culture with the Christian hierarchy of bishops and monks, who were themselves often recruited from the senatorial classes.At the same time, the recent emergence of an Islamic challenge to the West has urged our engagement with the Christian power that first withstood Muslim attacks and defended Europe’s eastern frontier for centuries. Byzantium is unusual among empires in having a precise beginning and end. Constantinople was inaugurated by Emperor Constantine in 330 AD and fell to the Ottoman Turks in 1453. 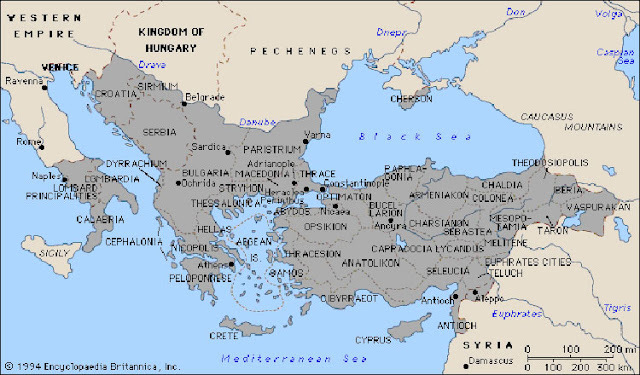 And across that long millennium it developed from being the eastern half of the vast Roman Empire into a brilliant medieval state that expanded into the Balkans, the Caucasus and southern Russia before being split into three separate units when Constantinople was occupied by the Latin crusaders between 1204 and 1261. It was restored to Byzantine rule, but the state gradually shrank to just the city and a few outposts in mainland Greece. The excellence of Byzantine administration–hardly Byzantine at all by our usage—is nowhere clearer than in the power of the Byzantine standard gold coin, the solidus (known as the bezant in medieval Europe). First issued by Constantine in the early fourth century, it retained its 24-carat value and was the coin of choice in international trade for more than 700 years. It took a self-conscious and creative government to manage this extraordinary achievement: one that puts to shame our present devalued currencies and monetary instability. Even after Byzantium’s conquest by the Ottomans in 1453, its culture and traditions continued to be felt far and wide. Czarist Russia claimed to have replaced Constantinople as the leading patriarchal see and styled Moscow as the “Third Rome.” The court rituals of Louis XIV’s Versailles mimicked the Byzantine imperial ceremonies, creating an elaborate pyramid of family relations with court officials in fixed proximity to the monarch and distinguished by specific costumes and weapons. Even the British coronation ceremonies can trace their origin back to Byzantium. And in many regions the Orthodox Church still sustains the Greek Liturgy, so richly endowed by Byzantine contributions. In this way, an enormous pile of booty “transformed the crusading paupers into the richest citizens,” as one Western monk put it. The famous horses of San Marco were robbed from Constantinople’s Hippodrome and mounted on the façade of the cathedral of Venice—which is itself a tribute to the Byzantine architecture of the dome, perfected six centuries earlier in the capital’s great cathedral, Saint Sophia. In the years after 1204, a vast number of Byzantine artifacts, silks, ivories, enamels and jewels found their way into western cathedral treasuries. The very designation “Byzantium” is a further complication (specialists dispute the name to be given to this empire).During the life of the empire, the term was reserved for Constantine’s city, originally a Greek colony called Byzas, whose inhabitants liked to vaunt their identity as “Byzantines.” All the others who lived within the vast imperial borders called themselves “Romans,” and they knew that their empire was Roman. Yet the adjective “Byzantine,” first adopted by 16th—century humanists to distinguish East from West, is more than just a convenience; it recalls the city’s original pride and draws attention to the extraordinary vitality of an empire the endured with such success after the Western Empire’s collapse. Constantine’s decision to be buried in a Christian mausoleum in the city set in place the process that helped to make Byzantium a Christian Roman Empire. All his successors wanted to be interred beside him, eventually creating a shrine to the Christian rulers of the Roman Empire. So why has this remarkable empire for so long been perceived as abhorrent and repulsive, when not being dismissed? The neglect of Byzantium by historians may be traced to the sack of Constantinople in 1204 by members of the Fourth Crusade. The crusaders justified their plunder and desecration of the Churches and Monasteries by projecting onto the city and its civilization all their own worst faults: The Eastern Christians were condemned as schismatics or even heretics; their wealth was therefore ill-gained and undeserved. From the beginning, Byzantium manifested highly creative and original impulses to re-fashion rich, pre-existing traditions. Its inner Greek fire came from a unique combination of traits. When Constantine created his new capital, he brought together Roman administrative skills, law and military traditions; the Hellenic wisdom long sustained by ancient Greek education; and the dynamic new Christian belief which later became the state’s driving force. As he fought his way from York to Rome and on to the East, Constantine came to know these strengths at first hand. Like most Romans, he appreciated the superiority of ancient Greek culture, which provided the essential education for all ambitious men—and some women like Hypatia, the fourth-century philosopher and mathematician. By the fifth century, Constantinople had schools to rival those of Athens and Alexandria and Beirut for law, with teachers paid directly from the imperial treasury. This re-fashioning genius can be physically experienced today in the Hippodrome of Istanbul—the Roman race track, almost in the shadow of the cathedral of St. Sophia—where Greek and Latin inscriptions appear on the base of an obelisk that originally commemorated a pharanoic military victory of the second millennium BC. The city quickly generated a highly sophisticated work force. Its artisans produced the Mediterranean world’s most elegant silks, carved ivories and gold enamels. Its engineers constructed the immense walls that kept all enemies out of Constantinople until 1204. The recent excavations of the harbor of Theodosius (today Yenikakpi) have yielded more than 30 boats and their cargoes and have shown how the capital attracted traders and craftsmen from across the Mediterranean. Venice, Genoa and Pisa established quarters within the city, while Syrian and Russian merchants stayed in particular residences when they came to trade. In the 1090’s, as the Western forces of the First Crusade arrived at Constantinople, they were overcome with awe at the wealth and sophistication of the Eastern Capital, the likes of which they had not even imagined. The city was larger than any in Western Europe, with a population of about 500,000—a level not attained by Paris until the 17th century. Byzantine innovations began attracting the interest of modern historians between the wars. Among the most notable was Robert Byron, whose discovery of the neglected empire produced the highly romantic and alluring views of “The Byzantine Achievement” (1929), in contrast, Jack Lindsay, in “Byzantine Into Europe: (1952), emphasized how Byzantium acted as a buffer between Islam and Europe. Steven Runciman’s well-researched and elegantly phrased books established a sympathetic appreciation of Greek Orthodoxy, particularly notable in “The Fall of Constantinople, 1453” (1965) and “The Great Church in Captivity” (1968). It also permeates his great three-volume “History of the Crusades,” an eminently readable account now criticized precisely for its fluency. Runciman’s “Byzantine Civilization” (1933) remains a short, accessible account that still repays reading after 75 years. Such historians established, half a century ago, how difficult Byzantium’s position was between aggressive states East and West. Academic authors have been less skilled at presenting their research in accessible ways—though I hope that my “Byzantium: The Surprising Life of a Medieval Empire” (2007) is an exception. But the contemporary interest in East—West conflict and how empires collapse has brought new readers to major reassessments of Byzantium’s historical significance and helped to extend the study of the “barbarian” forces that sought to bring down empires.Both Peter Heather’s “Empires and Barbarians” (2009), although it only treats the first millennium AD, and John Darwin’s “After Tamerlane: The Rise and Fall of Global Empires, 1400-2000” (2007) consider Byzantium in such a comparative perspective. It was the rise of Islam that ultimately undermined the dominion of Christian Byzantium. The empire checked the first great wave of Muslim expansion in the 630’s, and by 740 a more secure border with the caliphate in Damascus was established at the Taurus Mountains in southeastern Turkey. The empire had lost the rich provinces in Egypt, Palestine and Syria but over the years restored imperial control in areas of Armenia and northern Syria. Challenged by the Bulgars in the west, Byzantium also fought many campaigns in the Balkans; it always had to balance the two very distant fronts with the immense lines of communication and logistical support extending from the Caucasus to the Adriatic. In intellectual pursuits, Byzantine scholars learned Latin and translated works of Augustine and Aquinas, leading to greater knowledge of Western theology; they also copied and added to the Byzantine repertoire of epigrams, scientific writings and collections of letters. Jonathan Harris’s new study, “The End of Byzantium” (Yale University Press, 298 pages, $40), shows expert knowledge of the Greeks in the West and of the cultural trends in humanistic thought and explains the attraction of Latin theology for many Byzantine intellectuals. Mr. Harris provides a sympathetic reading of the civil wars and conflicts engendered by the empire’s fundamental problem in this era: how to balance Byzantine traditions with the need of military aid from the West in order to confront the Ottoman Turks. Although emperors continued to look West for help, it 1453 the Byzantines faced vastly superior forces (armed with the latest in cannon technology) support by only a few loyal Venetians resident in the city and a body of archers recruited by Isidore of Kiev and Bishop Leonard of Chios. It was a very unequal battle. In the end the Byzantines had to choose between East or West. While many aristocratic families fled to Venice, the peasants, who could not move, accepted Ottoman rule. It has been argued that their lives did not change much with the arrival of Mehmet the Conqueror. We can celebrate today a great civilization that stretched from Novgorod to Southern Egypt and from Spain to the Euphrates. The millennium of Byzantine Civilization profoundly influenced our modern world. Its achievements resonate and become clearer with every new excavation and major exhibition and historical analysis sympathetic to its surprising and lively character.